Unlike last week, there’s plenty of granularity here. 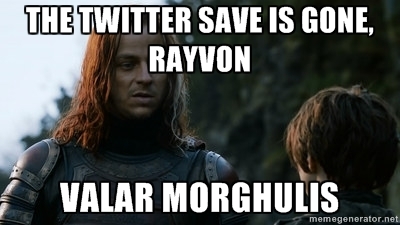 Rayvon is least likely to be safe. Not outside the margin-of-error, though. So look: I know that some people don’t like ignoring Votefair. It seems like, if that many people are voting for one person, how can you ignore it? But numbers don’t lie. Even in the old model, the one that had Dialidol, Votefair was bottomed out at 20% strength at this point in the contest. And now, without that history to calibrate by, we have no idea how it affects the outcome, but we know it’s probably very little. As far as the data for rounds with multiple performances, there is no statistically significant effect of Votefair. If it does matter, it’s impossible to say by how much. So, just like last week, take the above numbers for what they’re worth, derived from considering solely how many times a contestant was in the bottom group and the highest WNTS rating of the week. 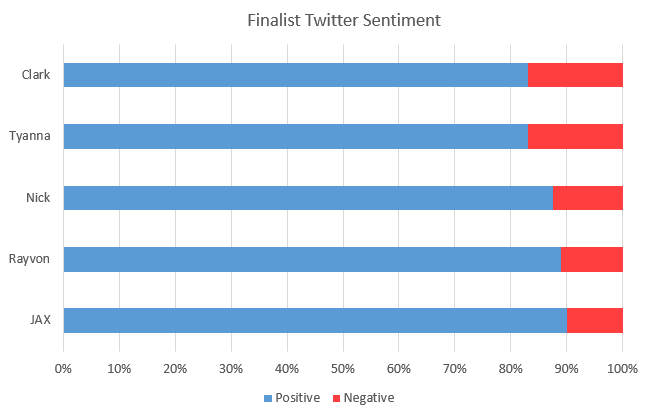 While Clark clearly has his fans, people on Twitter are a bit more negative on him than the others. The same is true of Tyanna. Rayvon, still going strong, has the second-highest number of positives. Note that I believe this week was the last week with the Twitter save. Valar morghulis. In case anybody was wondering, Dialidol is still hilariously wrong. I no longer know how many people are singing or what the hell is going on.